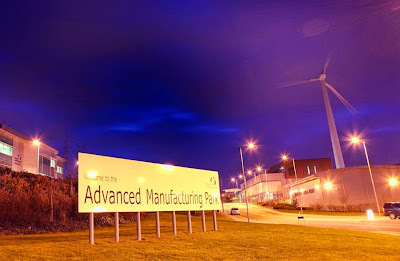 Rolls-Royce, one of the most famous names in engineering throughout the world, is to create a joint venture on the Advanced Manufacturing Park (AMP) in Rotherham with Unipart Group, a leading provider of manufacturing, logistics and consultancy services. Initially focused on aerospace, automotive, motorsport and the medical market sector, the new company will initially create around 30 high-end, technical engineering jobs at its new headquarters on the AMP. Rolls-Royce has a long association with the UK's premier advanced manufacturing technology park, being a lead commercial partner with the University of Sheffield Advanced Manufacturing Research Centre (AMRC) and recently opening its own £110m factory - the most advanced turbine blade casting facility in the world. After securing a further £10m funding, the University opened the 4,500 sq m AMRC Rolls-Royce Factory of the Future in 2008. Rolls-Royce has also used the AMP Technology Centre to house experts in its Pro-Laser Technology team which is pioneering new design and manufacturing methodology in laser cut sheet metal and press brake manufacture. Pro-Laser Technology enables the ultra-rapid production of fixtures, tooling and specialist devices, by incorporating an innovative design approach, patented joining techniques and a low-cost laser-based manufacturing process. With typical cost reductions of 50%, techniques are used that do not require any welded joints. Instead, patented joining features are laser-profiled into the flat-sheet elements creating patented Pro-Laser clamping and locking mechanisms. Fully finished plates are then mechanically assembled with simple hand tools. Currently it can take months to design and manufacture a special tool or product using conventional methods and thinking. Applying MetLase technology can reduce this from months to weeks or days saving valuable time and enabling products to be brought to market far more quickly. Hamid Mughal, director of Manufacturing, Rolls-Royce, said: "We see creating a JV with Unipart as an excellent opportunity to work with a well-established cross-sector partner with complementary skills to help accelerate the development of the MetLase technology and widen its use into a broader range of markets." John Neill chairman and chief executive at Unipart, added: "We're very pleased to be taking this important step with Rolls-Royce in a partnership that will establish an incubator for innovation in the aerospace industry, and will extend into other areas in which we have deep expertise such as the automotive industry and motorsport."